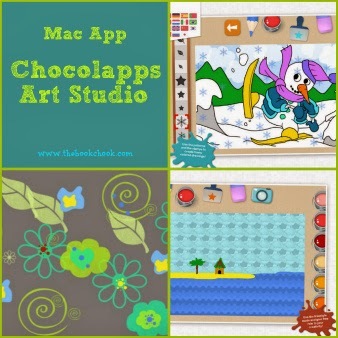 Chocolapps Art Studio is the first app for children I’ve downloaded onto my Mac. Mostly I review iPad apps for children, but I was keen to check out Mac apps too. I chose Chocolapps Art Studio because I discovered it seemed to have a fairly full-featured freestyle drawing tool, and that intrigued me. Colouring-in tools are fairly common, but nice simple drawing tools with fill options aren’t so easy to find. I also love to find tools that children can create with. The Chocolapps Art Studio app is free to take a look at. You can colour one scene and look at what else is available. To unlock the other scenes and the freestyle drawing tool, you need to pay $0.99. The plentiful scenes are fairly similar, a cartoonish snowman in various poses in a winter landscape. Kids who like to colour will enjoy filling various parts of each scene with colour via a click of the mouse. But to me the creativity comes in when the drawing tool is used. There are pencils (brushes) with lots of lovely colours, stamps (see some in my image bottom left in the collage above) and a fill tool. These tools are intuitive and work very smoothly. I had several problems with the app, but I was very impressed with the prompt and courteous help I received from the Product Manager, Jordann le Gal. It wasn’t obvious to me how to save an image I’d created with the app. My problems? I saw the camera icon, took a snap, understanding that was save. But I had no idea where to find the resulting image. On the iPad, I would have gone straight to my Camera Roll. On the Mac, I discovered I should look in my Mac picture file where the image appeared as a png file. I also couldn’t see an obvious way to quit the app. It seemed crazy to have to Force Quit to get out of a fullscreen app. Jordann explained I needed to take my cursor to the very top of my screen. Suddenly a menu appeared along a top bar that was the obvious place to quit. In the same way, I learnt I could find my dock along the very bottom of my screen. Obviously I am not used to fullscreen apps! I also had to uninstall and reinstall the app a couple of times as it would lock the fill tool after an update. Why not take a look at Chocolapps Art Studio to see if it’s what you want for your children or students? If you decide it is, $0.99 certainly isn’t a lot to pay. I think young artists might enjoy it as a tool for creating digital art, especially if there’s not enough time to get the “real” paints and paper out. When children want to spend time with a screen (as part of a balanced out-of-school time consisting of outdoor play, building with blocks, reading and playing pretend), I would so much rather see them creating something than killing zombies. Wouldn’t you? Check out my iPad App Reviews on Pinterest.